Bill Griffith has been an active cartoonist since 1967. Since then, he’s made hundreds of humorous comics ranging in publications from the National Lampoon to The New York Times. While he has done an assortment of different comics with characters and sketches, none are more well known then his comic strip of Zippy. His Zippy comic features a pinheaded character by the name of “Zippy”. While his clown suit and head shape are recognizable, it’s the random blurbs and devotion to miscellaneous objects that satire consumerism that make him so memorable. Zippy gives any reader a topic of conversation with his philosophical conversations with God, a fast talking schemer, a lounge singer, a hapless working man, and other characters giving tons of opportunities for non-sequiturs. Comic art began in the early 1920’s as a way of talking to an audience about politics, educational information, different realities, and even commentaries on real life situations all for the purpose of making someone laugh. The golden age of comics back in the mid 1900s was a time period full of change. During this time, the American people saw many different cartoonists present a whole array of political points of view and personal ideas. However, regardless of the politics, the goal was always the same: to make people laugh. The comics were able to produce a type of imagery that television or film was not able to offer because it was drawn and could go beyond realism. Because of this, cartoonists could play around with different themes and offer another lense for comic characters to show the American people. 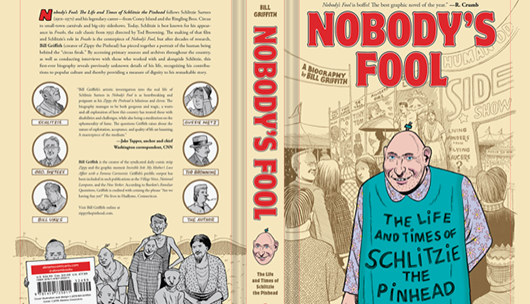 This was only possible because of artists like Bill Griffith, who not only offered a unique, humorous, political perspective during not so funny times, but also allowed an audience to collectively engage and discuss different ideas and artforms that an artist presents; much like the goal of Real Art Ways.